Ever since its announcement eight years ago, our enthusiasm and hype for Dragon Quest XI: Echoes of an Elusive Age was at an all-time high. With news of its return to its traditional roots with a single player story-driven experience, we were ecstatic. 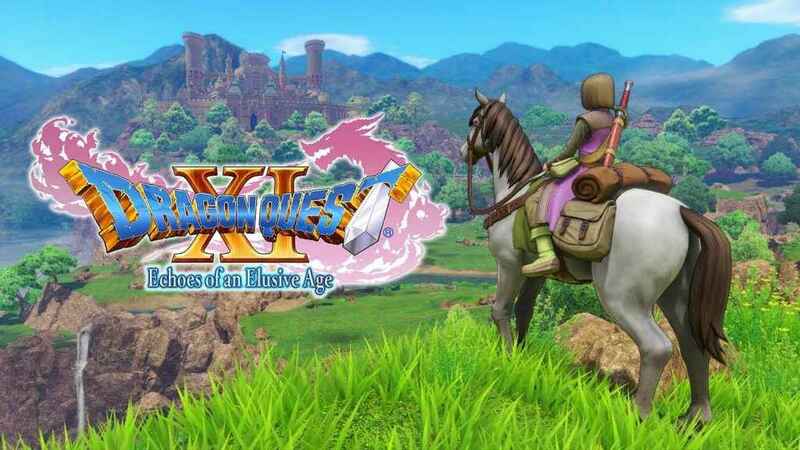 Now eight years later, we’ve finally gotten my hands on the title, and are happy to report that not only does Dragon Quest XI meet our expectations, it shatters them in ways we didn’t expect. The Dragon Quest franchise, or Dragon Warrior as it’s known in Japan, has always held a special place in our hearts. From its colorful cast of characters to the great character and monster designs – using the great and distinct art style provided by acclimated artist Akira Toriyama of Dragon Ball fame – there is always something about each Dragon Quest title that feels special when you play it. Dragon Quest XI: Echoes of an Elusive Age keeps that special magic going. The story in Dragon Quest XI doesn’t tell a unique story. In fact, it’s a story we’ve seen and experienced hundreds of times in the genre before. What makes it great this time around is its execution. We’ve spent well over 150 hours with Dragon Quest XI, and have experienced the entire emotional spectrum. From sadness, laughter, sheer joy, and, worst of all, heartbreak, the game is a great emotional roller coaster that we won’t forget any time soon. The land of Erdrea is a land of peace, and in the kingdom of Dundrasil a young child is born with a special mark on his hand. Soon after, the kingdom is attacked by monsters. In a daring escape, the young child is left in its crib and sent downstream where the child is rescued by an elderly man and raised in a small village. There, he learns he is the Luminary. The Luminary is the reincarnation of a great hero destined to put a stop to the darkness set to destroy the great life-giving world tree Yggdrasil and engulf of the world of Erdrea in darkness. Learning of his destiny, The Luminary sets off to the great kingdom of Heliodor to show that The Luminary is alive and ready to take on the forces of darkness. Things don’t go according to plan as The Luminary is imprisoned. The king believes The Luminary to be the bringer of the darkness rather than the one destined to fend it off. After a prison brake with new companion Erik, The Luminary sets off in a grand adventure to reach the great tree Yggdrasil and put a stop to the darkness from spreading. While on your journey you’ll encounter a color cast of characters, some will help you others will try and stop you. Sticking with tradition, Dragon Quest XI once again boasts a great cast of party members that join you on your quest. They all stand out for one reason or another and each one contributes not only to the overall story but to the party as well. Veronica in particular is a feisty little girl with a mouth on her constantly talking down to everyone she encounters but her charm is undeniable and you can’t help but love her. Veronica is just one example of the eight colorful members that join your quest. The party in Dragon Quest XI is probably my favorite of the franchise. A lot of them feel like a celebration for Dragons Quests 30th anniversary. Throughout our time with Dragon Quest XI we got to experience a vast world full of magic and wonder. The world of Erdrea is gorgeous and full of life. As you explore the world and take in the sights you’ll see that monsters have their own habitats they live in and also follow their own routines. Some monsters go to sleep at night while others are wide awake. 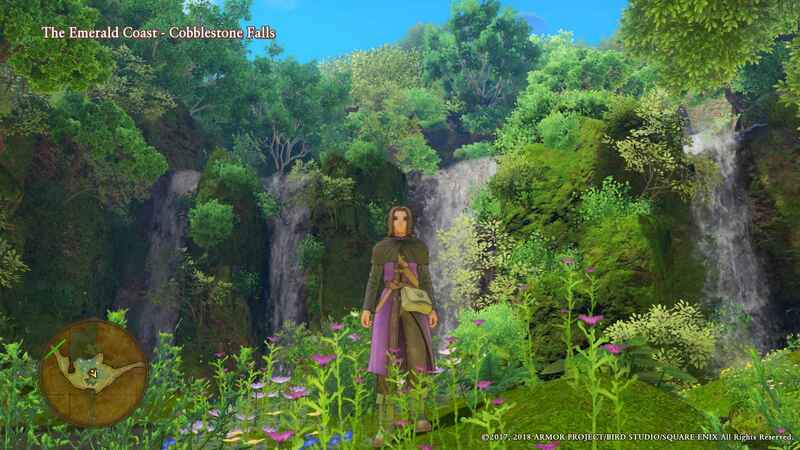 The world of Erdrea isn’t exactly an open world like it was in Dragon Quest VIII. Rather it’s separated into different regions and kingdoms. Each content is ruled by its own kingdom that you can explore freely. 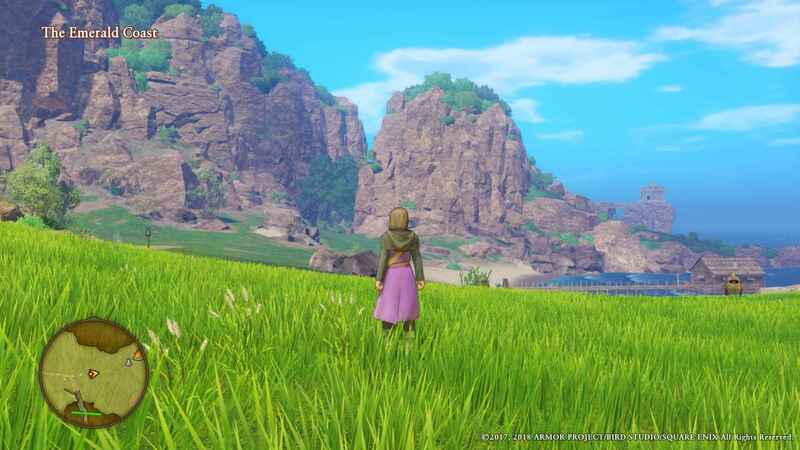 The regions themselves are still vast and open, so in a way, Dragon Quest XI does a great job of feeling like an open world game without feeling overwhelming to explore. The regions are also full of materials for crafting that you find on the map or you can spot in the environment. Materials sparkle and are easy to spot. The regions are also full of side activities like targets for you to hunt down using a crossbow, hidden treasure chests to find, and side quests to conquer. Monsters this time around appear in the environment rather than force you into random encounters. The battles can be avoided altogether, but I wouldn’t recommend it. I’m not saying that you should fight every single enemy that you see but combat is quite important in Dragon Quest. Dragon Quest is notorious for being a difficult RPG franchise so grinding is a must. The good thing about Dragon Quest XI is that as long as you battle every monster in your direct path you should be okay. We didn’t find Dragon Quest XI to be as difficult as past titles, but maybe we were just more prepared this time around. 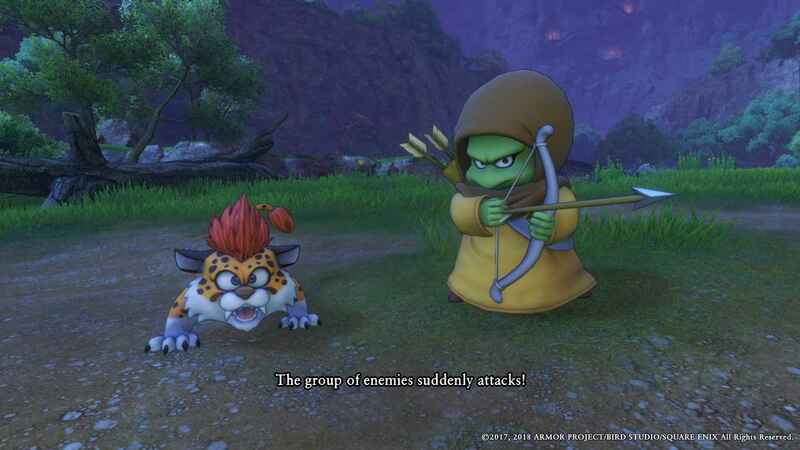 When it comes to combat, Dragon Quest XI is unique. 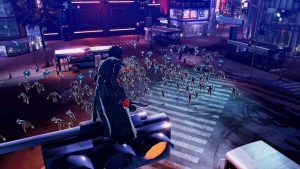 Not because it revolutionizes JRPG turn-based combat, but because it’s unique in letting you customize how you experience the combat. 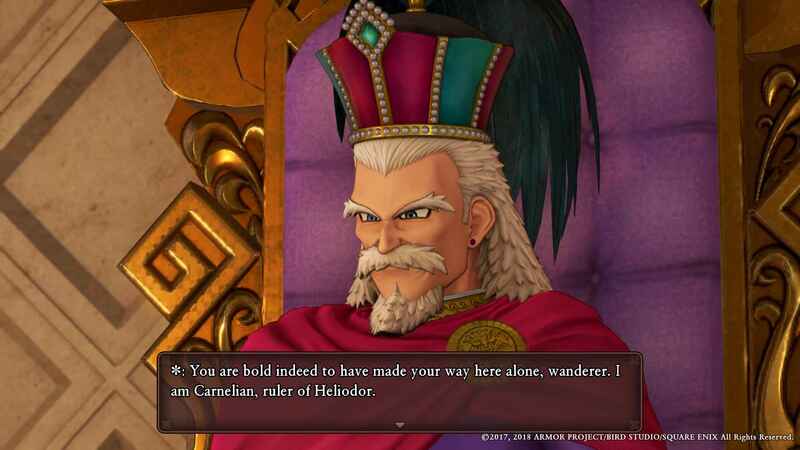 Dragon Quest XI is a traditional turn-based RPG. You take turns attacking by selecting options like using abilities or spells and then you wait for the enemies to do the same. It’s as traditional as it gets. What makes it fun, and more importantly what keeps it from being stale, is the ability to customize the A.I. to act on its own. Hell, you can get through full fights without having to press a single button in combat. Messing with the tactics, you can order your party members (even The Luminary) to fight based on healing, full offense, defensively play or simply being well-rounded. At first we thought that if we set the party to fight automatically, they would just blast through all the MP (Magic Points) as quickly as they could. To our surprise, they acted intelligently and conservatively, using specific skills when needed and fighting normally when skills weren’t needed. Once they found out what a weakness of an enemy was, they would exploit that weakness to full effect but not to the effect that they would blow through all your MP. Another nice addition to combat is changing how combat is performed. You can play the traditional Dragon Quest style, where you simply perform actions from a menu system, watching the combat through cinematic camera angles or change the combat to feel more like an action-RPG. This means you can run around with your selected party member on the battlefield. 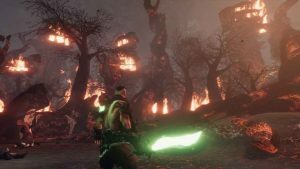 The more action-orientated combat is interesting simply because it doesn’t change how the combat plays out. You don’t go in and attack like you would in an action-RPG; instead it’s mostly used to give you the illusion of an action-RPG. The combat itself still plays out like it would normally, the only difference is you can position your character however you want. 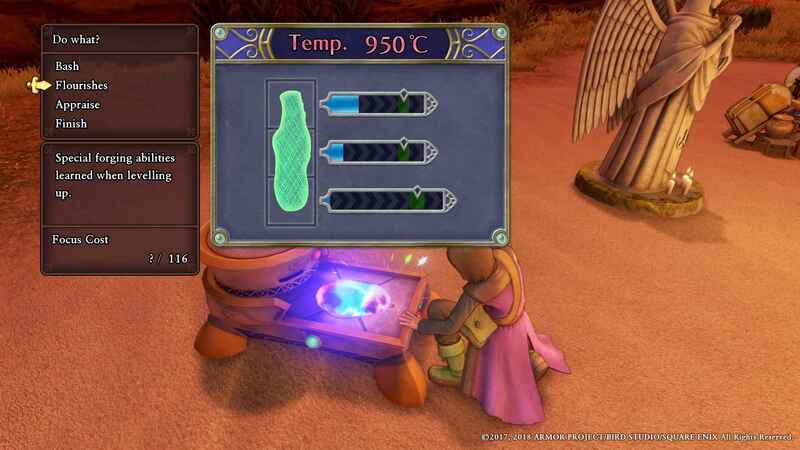 Dragon Quest XI also features a fantastic crafting system. In order to craft in Dragon Quest XI you must first find recipes. These can be found in a number of ways from reading books, treasure chests, or completing side quests. Once you have a recipe you can craft the various equipment and accessories given you have the materials to do so. Crafting is fun because it plays out like a mini game, and you must hammer the equipment you’re trying to craft and fill up various bars with each hit. These bars have a specific marker. Filling up the bars as close to the markers will increase the equipment’s quality. Each strike also costs Focus. The more you level up, the higher this Focus Cost goes up. Each strike takes a certain amount of focus and the great the striking skill the more focus it takes. If you run out of focus, you end up creating an unfinished piece of equipment so you always have to make sure you’re using the right strike ability for the occasion. You can’t deny just how amazing the visuals in Dragon Quest XI are. As we mentioned before, Akira Toriyama’s style shines through in Dragon Quest XI. The character models have a unique anime look to them that isn’t quite cel-shaded. It definitely stands out and some people will recognize a lot of the hair styles and looks of characters straight from the Dragon Ball franchise. The monster designs are also great. It’s fantastic to see some of these monsters who have been part of the franchise since day one get this great graphical treatment. Some of the newer monsters have been given some really creepy designs, too. The sound work is also quite exceptional. Each character speaks with an accent, making the world feel more organic because they’re all from different parts of the world. This is not something you see very often in games. The voice work is a great addition that’s been added to the worldwide release of Dragon Quest XI, since the original Japanese release didn’t have any voice over work done at all. Another great achievement is the unique score. For those who have played Dragon Quest in the past will quickly recognize the style. It’s hard to explain but it’s more orchestral and happy-going then you would expect. It’s the type of music that’s been a staple of the franchise for quite a while. It’s a shame that they weren’t able to use the actual orchestral recordings found in the Japanese version of the game due to licensing issues, but for the most they did a great job mimicking the scores. If there’s one slight negative to point out, it’s probably the menu system, which can feel a bit dated and some might find it a little awkward to navigate, but it didn’t take me long to figure it out. It’s also important to note that you can’t pause the game, even in the menus, so its important to keep that in mind when out in the field. 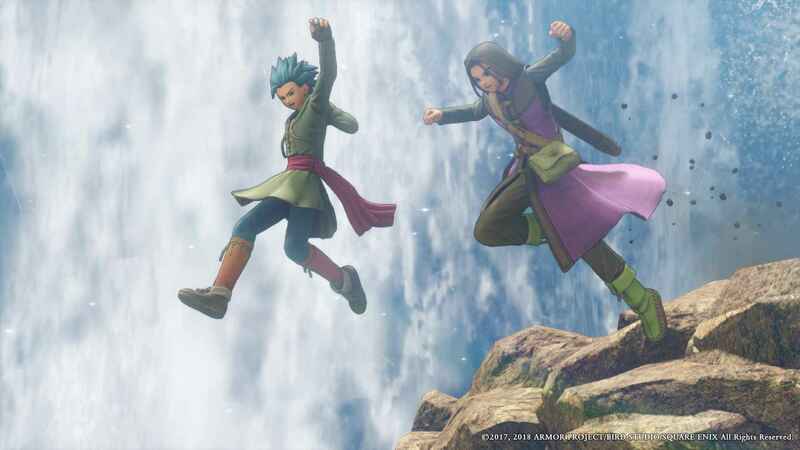 Dragon Quest XI: Echoes of an Elusive Age is a grand achievement for Square Enix and series creator Yuji Hori. We went into Dragon Quest XI with high expectations and it exceeded those expectations in every way. Dragon Quest XI is quite possibly the greatest JRPG of all time. 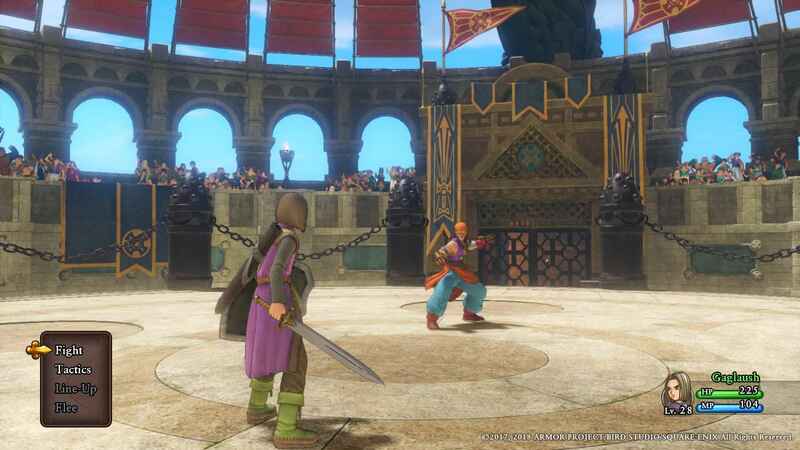 Dragon Quest XI: Echoes of an Elusive Age from Square Enix releases on September 4th, 2018 for PlayStation 4 and PC. Nintendo Switch release TBA. An incredible achievement, and even after 150 hours in we didn't want it to end. 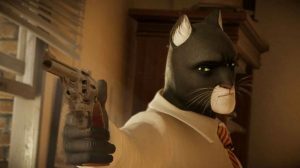 From an emotional story, simple yet engaging combat, and gorgeous visuals. Dragon Quest XI: Echoes of an Elusive Age is simply remarkable and shouldn't be missed. Now this is an RPG unlike the FF series has become. Glad to see it back on PS. Do you guys use editors anymore? So many incorrect words (you’re and your, content v continent color v colorful etc ad nauseam) and shifting from first person singular to plural that it felt a bit like I was reading a badly translated JRPG . I’m far from a grammar nazi but surely you can give your articles a rudimentary once over? Thank you for the edit; so much better!